The waters in these parts of Speyside are known not only for their purity but also for their healing powers according to druid priests that lived there in times of the Celts. Later, they used the same water to baptise them into Christianity. So it is no wonder they used nature's best and produced a fantastic product. What is better to make from water than Scotch Whisky!? True to this legacy and heritage, young James Fleming, a farmer's son who supplied grain to local distilleries had a dream to build a perfect distillery in the 19th century. A daring modernist as he was, he did not let anything differ from his expectations. And his dream of the perfect dram lives to this day, in the Aberlour distillery. 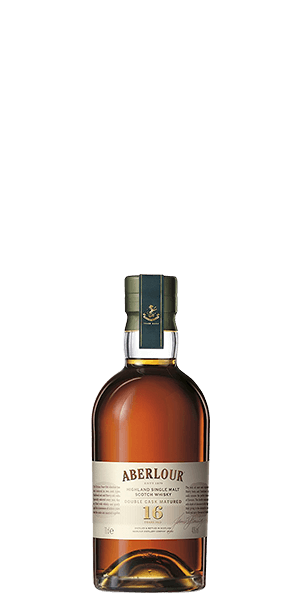 Matured in two different casks, this is a complex and rich dram. It is fruity and spicy with a little hint of sweetness from the thick, oak wood. The barrels play a massive part in the finished product and can be tasted in a sweet oakyness with a good amount of spice on top. What does Aberlour 16 Year Old (40%) taste like? The Flavour Spiral™ shows the most common flavours that you'll taste in Aberlour 16 Year Old (40%) and gives you a chance to have a taste of it before actually tasting it. Apples and pears with warming nutmeg. Oranges and cloves, dried fruits and apples, with a little hint of thick caramel and cinnamon, oak wood and vanilla. Very nice, I have bought several bottles.......try it!! Solid Sherry aged single malt, silighlty sweet. Not overally impessive, but it isn't something I would ever say no to. Spicy and sweet, strong Carmel...excellent!! Smooth crossover to scotch for a regular bourbon drinker. Bit of smoke, not overwhelming, sweet. Very nice. Too chemical for my taste. A sweet treat! This was exactly what I wished for when looking for a very sherry whisky.